Among the things that seasoned parents told us we absolutely must get for our tiny new roommate was heavy blackout curtains. They’ll buy you so much more sleep!, everyone said. The darker the better! And I confess, as a snobby naïve non-parent who runs on solar batteries: I was skeptical. I mean, I’d really like an easy-going kid, you know? One that doesn’t care how dark it is. One that could sleep through the blazing light of ten thousand suns without a care in the world. One that had been trained to sleep anywhere, anytime. I mean, Mr. P and I have always slept with the curtains open. Maybe our kid could be the same way? But then I considered the alternative. A kid who doesn’t fall asleep in daylight, who needs those blackout curtains, who would maybe sleep just fine if his mom would stop flooding the room with her beloved sunlight, geez. Wouldn’t it be better if we had blackout curtains, just in case? And so. 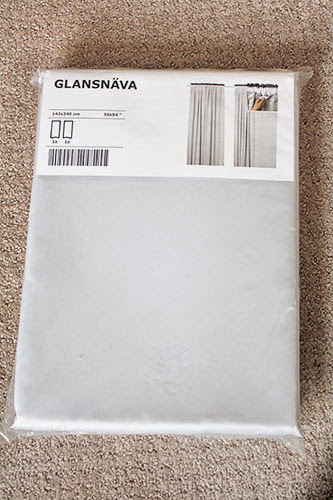 We got these GLANSNAVA liners. See, I wasn’t really ready to give up my white, light, breezy VIVAN panels just yet. The nursery gets THE BEST light of any room in this house, and it was sort of heartbreaking to hang up dark, heavy curtains. So, these were my mental compromise. 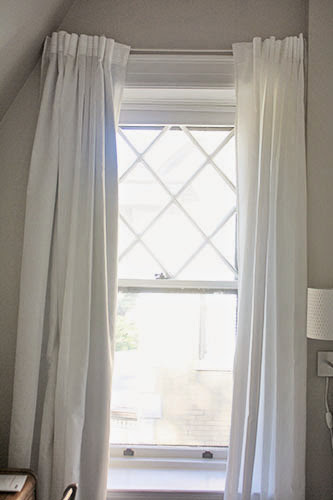 At $25 for two panels (times three windows), they weren’t my most budget curtain purchase. 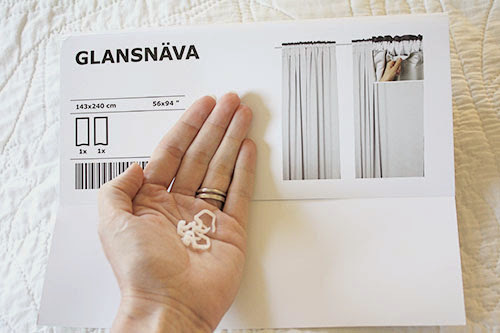 But they’re pretty inexpensive as far as blackout curtains go – and they’re easier and cheaper than dealing with by-the-yard blackout fabric (yup, I price-compared), especially since they’re the same dimensions as my existing IKEA curtains. The back side (i.e. the side with the rod pocket) is dark gray, but the front side is super-shiny polyester white. 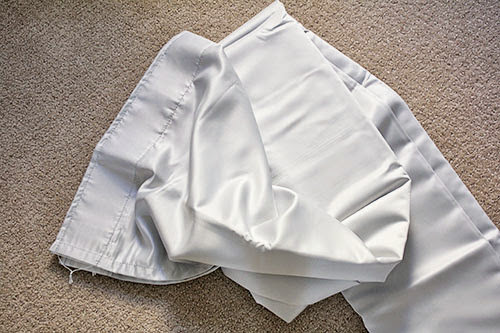 I did consider for a hot minute just hanging the liners alone – hey, they’re white too! 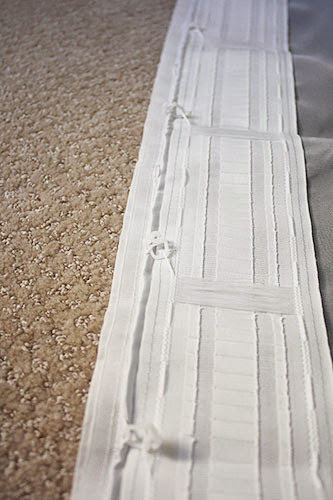 ... to attach the liners to my existing curtains. And THAT is easier said than done. First of all, here’s the extent of the directions, with my hand and clips provided for scale. Oh yeah, totally clear how to fasten them together. Uh huh. 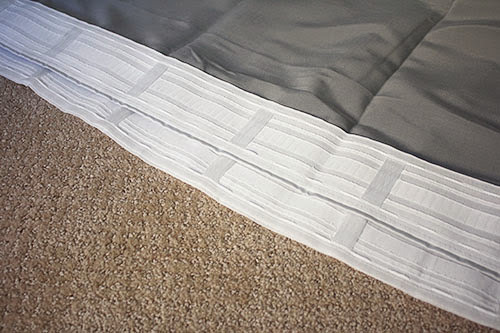 Then there’s the fact that the photo – and this blog post dedicated to solving the same problem – showed that the back side of the liner faced toward the room. Leaving aside the fact that I don’t get how you hang them if you’ve sandwiched the rod pockets on the inside, that’s the dark gray side. So yes, it totally shows through the semi-sheer VIVANs. Not cool! 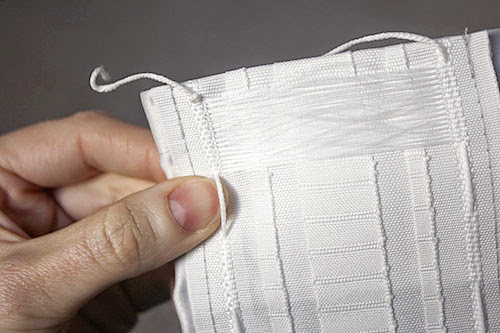 The blogger above remedied that problem by sewing the light side of the liners against the back side of the VIVANs. But... I don’t want these liners permanently attached (fingers naïvely crossed for easy-going, light-loving baby!) and I especially don’t want to sew. Are you kidding? No way. ... but it would probably need some reinforcement. So, I untied the existing knot, and made a few knots in each string closer to the opening. See where my thumbnail is sticking under the string? That’s the loop for both panels that’ll get hooked together with the clips. And I only had to slip them in the loops of both panels and clip them closed. 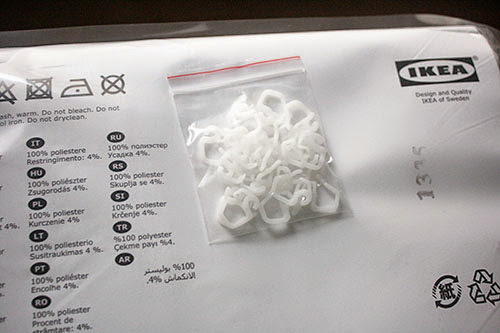 There’s enough clips in the package to attach about one clip per pocket-tab thing in the back. 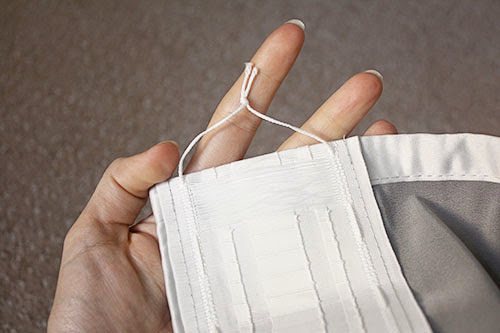 That helps the VIVANs pleat the same way that the liners do (because the liners are the part actually hanging on the curtain rod). Then it was just a matter of hanging them back up! 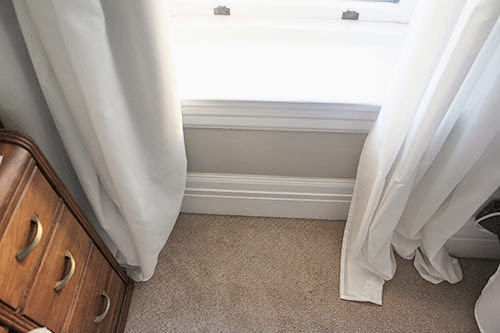 As you might expect, a lined curtain is way way fuller than an unlined one. Check out the VIVAN + GLANSNAVA on the left, with the plain VIVAN on the right. Oh, and if you’re wondering if I hemmed them: no I did not. Pregnant lady with work deadlines and a million other things to do? Yeah, they’re not hemmed, and they’re fine. They even do that “puddling” thing better with the liners! 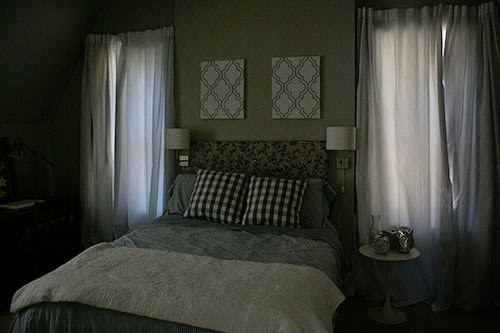 Not that I prefer the look over nicely hemmed curtains, but hey. Priorities. Whoa! They weren’t joking about light-blocking, were they? I suppose they could be even darker, but then I would barely be able to see what I’m doing. And anyway, I’m pretty sure the room isn’t this dark even at night given all the city lights. Okay then! Kid is born in the "darker" time of year when evening darkens sooner. Kiddo will not have a problem going to sleep then. It's summer time when it stays light outside until something like 11pm (ok not really but when you want a kid to go to bed and it's still light out at 9pm, it sure feels like 11pm before they actually DO go to bed). That's when you'll love having the liners. The other plus of the liners is, it might provide just a wee bit more insulation to the window helping keep winter chill at bay. 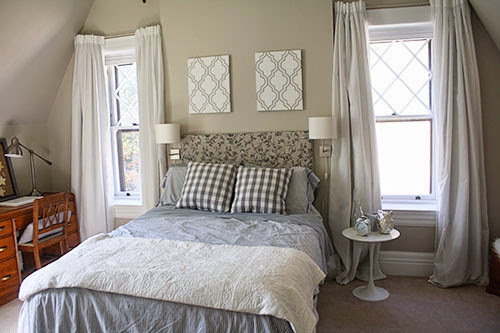 Love the look of the the curtains with the liners. 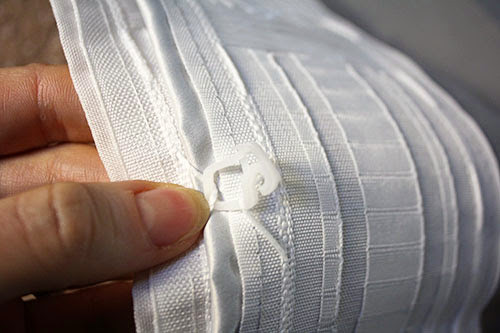 Those little plastic clips are very weird to work with though! I had similar trouble figuring them out on our curtains as well.